The first thing you have to work on to develop a good golf stance, is the position of your feet. That needs plenty of attention. How far apart should my feet be? What is their position in relation to the direction line? Which way should they point? And should the weight be forward, on the balls of the feet, or backward, on the heels? It is generally agreed now that the feet should be about as far apart as the width of the shoulders — the feet at the instep, that is. This is wide enough for good balance, and balance is important in getting ready to swing the club. 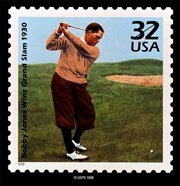 Former American golfer Bob Jones used an abnormally narrow stance. He liked it because with it he could get the full hip turn that he wanted on the backswing. Jones had a bigger hip turn than most of the good golfers of his day, or since. There were others in the Jones and pre-Jones eras, though, who took very wide stances, particularly some of the early British stars. In fact, at that time, stances and swings generally varied a great deal more than they do now. 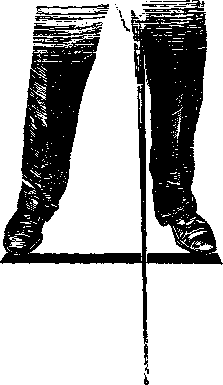 As to the feet in relation to the direction line, use the square stance (See the illustration above). That is, have the feet an equal distance from the line, especially for any full shot with a No.5 iron up to a driver. With a square stance the average person will have enough freedom for a backswing which is full, and for a forward swing that is free. That is a must in a perfect (or at least, efficient) golf stance.